Citation Information: J Clin Invest. 2007;117(12):3603-3609. https://doi.org/10.1172/JCI33297. The voltage-gated sodium-channel type IX α subunit, known as Nav1.7 and encoded by the gene SCN9A, is located in peripheral neurons and plays an important role in action potential production in these cells. Recent genetic studies have identified Nav1.7 dysfunction in three different human pain disorders. Gain-of-function missense mutations in Nav1.7 have been shown to cause primary erythermalgia and paroxysmal extreme pain disorder, while nonsense mutations in Nav1.7 result in loss of Nav1.7 function and a condition known as channelopathy-associated insensitivity to pain, a rare disorder in which affected individuals are unable to feel physical pain. This review highlights these recent developments and discusses the critical role of Nav1.7 in pain sensation in humans. 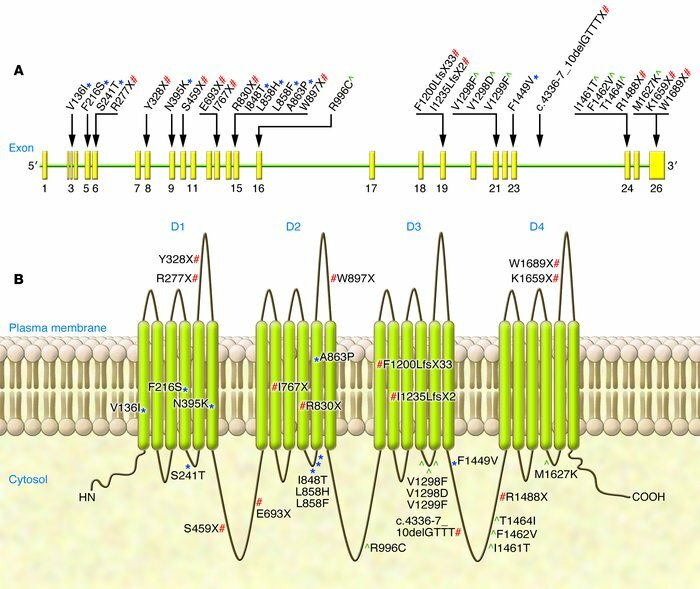 Mutations in the sodium-channel subunit Nav1.7 that are associated with the genetic pain disorders PE, PEPD, and CIP. (A) Nav1.7 is encoded by the 113.5-kb gene SCN9A, comprising 26 coding exons. The identity and location of known patient mutations in Nav1.7 that have been linked to PE (*), PEPD (^), and CIP (#) are shown. Note that the mutations are spread over the entire gene sequence; however, mutations linked to PEPD tend to be located closer to the 3′ end of the gene. (B) A schematic of the Nav1.7 sodium-channel subunit showing the 4 domains (D1–D4), each with 6 transmembrane segments. Locations of known mutations associated with genetic pain disorders PE, PEPD, and CIP are shown. COOH indicates the C-terminus of the peptide chain. HN indicates the N-terminus of the peptide chain.